I love Halloween. My normal Halloween tradition is to watch and rewatch old horror movies from the 80's. I also have a huge love for the original Universal movie monsters, especially Frankenstein, the Creature from the Black Lagoon, and the Mummy. 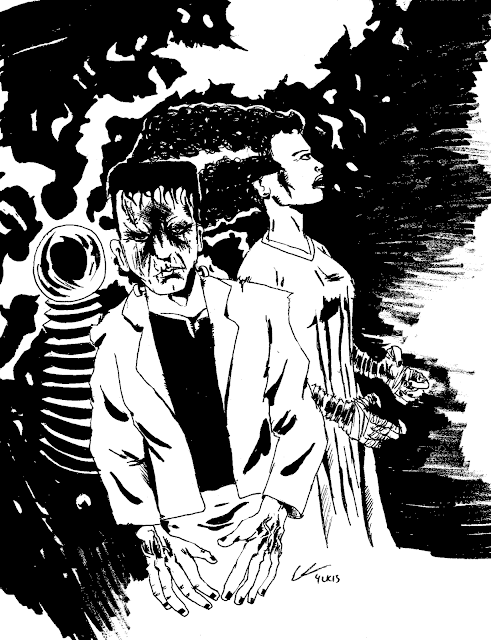 Frankenstein and the Bride of Frankenstein is drawn in mostly a G2 gel pen and then huge parts of it were blacked out with a fat tip Sharpie pen. I like my version of Frankenstein (or Frankenstein's monster for sticklers), where he has gross looking scars without looking too grotesque. The Bride of Frankenstein's hair was me just doing squiggly lines so I can get that curly, messy look. I am a little disappointed by the Bride's face. I wanted her to have that wide-eyed look, but I drew her with the expression of " I can't believe you left the dirty dishes in the sink again!" I guess you could read her face as if her and Frankenstein have marital problems.